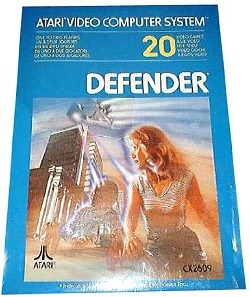 Defender was developed by Williams Electronics in 1980 and released into the arcades in February 1981. It featured 2D, side-scrolling graphics which were ahead of their time. Set on an alien planet, the idea of the game was to defeat waves of aliens whilst protecting astronauts on the planets surface. The game's two designers were Eugene Jarvis and Larry Dema who were pinball game designers at Williams. 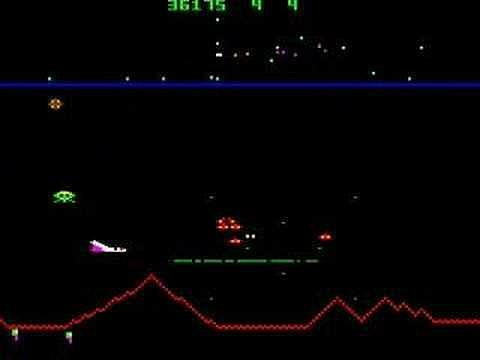 Defender was one of the most challenging titles from the whole of the 1980s and actually seemed complex compared to other arcade games from the early eighties. This led to the game being slow to gain in popularity. However, once people learned how to master the controls, Defender went on to become the best-selling arcade game for Williams, and one of the best-selling titles of 1981, even giving Pac-Man a run for its money. In the video playlist above you can watch game play on the BBC Micro, Atari 8-bit, Atari 2600 and Commodore 64. 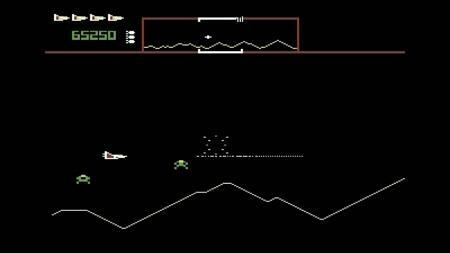 The game spawned lots of clones, including Dropzone which was released by Arena Graphics in 1984 for the Atari 8-bit and Commodore 64 computers. Dropzone won critical acclaim in most computer magazines of the day, including a gold medal in Zzap! 64 for the C64 version with a 95% rating. 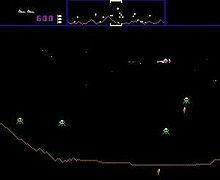 I remember playing Dropzone on my Atari 800XL and it was extremely responsive and a joy to play. No, I'm not going to make any rude comments about girls and joysticks! It's not the 80s, you know! Ths BBC version was developed by Acornsoft and was a very authentic clone. In fact, it was too authentic for its own good and this led to the game being renamed Planetoid for legal reasons. The game was also released on the Acorn Electron, the budget version of the BBC Micro. Acornsoft were pretty brilliant at game conversions, and this is, without doubt, the best of all the home computer versions from the 80s, although the Atari 8-bit version runs a close second and has some excellent sound effects. The Atari 2600 console version of the game i is very different to the arcade version (both in terms of gameplay and graphics) due to the hardware's limited capabilities. 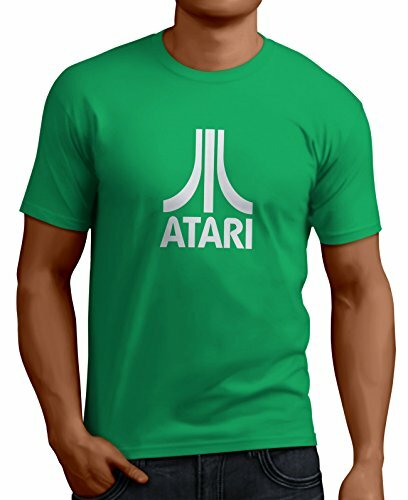 In fact, all of the Atari 8-bit versions really lacked the refinement of the original. 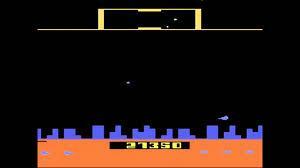 However, it has to be said that the Atari 2600 version was pretty dismal. There are numerous problems, the main one being that your spacecraft disappears temporarily when you fire a missile. Whether this is the fault of the hardware or the programmer is up for debate, although other games managed it with ease, so my guess is that the programmer was at fault. Aliens also flicker and are pretty erratic with their movements, too. The controls are pretty clumsy and I'm not sure how this game seemed to slip under the radar when Pac-Man and E.T. got such a roasting from the critics. As with the Atari XL and XE computers, the C64 was a very capable and advanced machine for its time. Although not as refined as the arcade version, the game plays well on the C64. 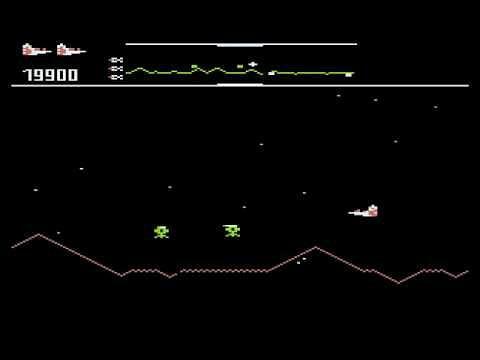 It looks a little crude, but this was one of the earlier C64 games and the graphics look more Hi-res than other home computer versions. The sound effects are excellent and I also like the way the screen compresses and disappears to the right when you move up a level - a nice touch.